Before you’re knee-deep in contemplating centerpieces and crafting the perfect playlist for your wedding day — there’s the engagement party to plan! To us, this is the time to celebrate with close friends and family and should feel like a personal and casual event. We’re big fans of backyard gatherings — anything that allows you to customize the vibe of the get-together without the pressure of tying everything back to your wedding decor. To keep it casual, rather than organize an official seated dinner, opt for a more help-yourself-roaming-mingling vibe (yes, we just made that up) where you don’t necessarily have to provide a seat for everyone. We suggest giving guests seating options that are comfortable, yet still encourage people to move around and socialize. 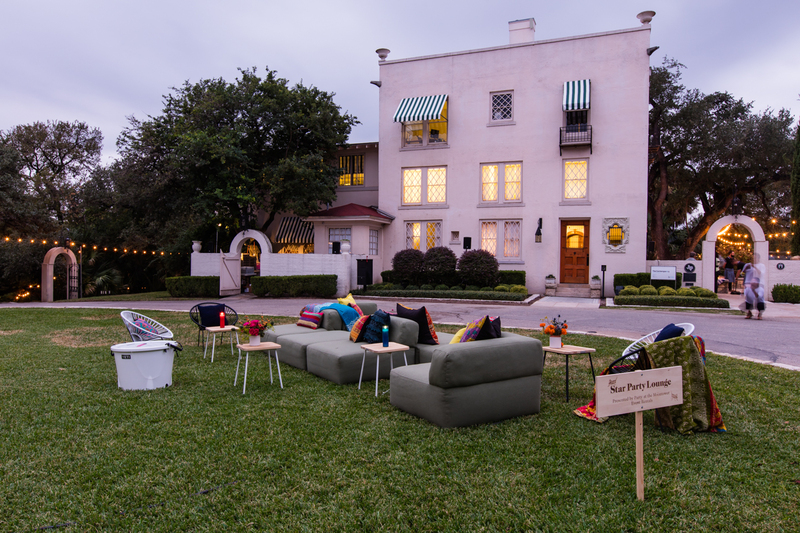 For the backyard engagement party, our Aviator Modular Sofa is completely customizable and allows for a lot of lounging space, while the Paloma Loveseat and Chairs thrive outdoors. While you don’t need an open bar or dance floor at this event, you’ll want a few activities to entertain guests while they wait for their turn to chat with the newly engaged couple. We have a corn hole set with LED lights for nighttime that is an absolute hit at outdoor events. We also have a fire pit for rent that will add some ambiance to the evening. If you want to get crafty and play some classic games, here are 10 suggested engagement party games for guests. We love incorporating details that are small in scale but make the event feel customized to your tastes. After all, the purpose of an engagement party is to celebrate the new couple alongside close friends and family, so it should be a representation of what you love! Our ready-made lounges include the textiles, side tables and plant life that complement the engagement party rentals you need, and may even inspire your chosen theme! A full buffet and an open bar aren’t expected, but a few snack and drink options are always welcome! Skip the folding table and opt for a display that makes guests want to snap a photo of the dessert spread. It’s the little things like this that will make your party memorable. Our Mai Tai Table was made for such a task and is a practical way to elevate your events. Planning an event of any size can be stressful and overwhelming — it’s our goal to bring the fun back to parties! Whether you need engagement party rentals or the perfect seating for your wedding guests… we’re here for you!